A ban on slurry spreading came into effect at the weekend and will last until February. 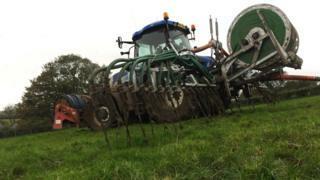 Farmers said soft ground conditions have made it difficult to empty slurry tanks ahead of the close of season. The Northern Ireland Environment Agency said it was aware of the pressure and would treat the issue "sensitively". But it said it had a responsibility to protect water quality. Only 38% of Northern Ireland's watercourses are in good condition. The target is to increase that to 70% by 2021. Slurry is a nutrient for grass but a pollutant in rivers and lakes. The ban on spreading it runs from mid-October until 1 February. It is an EU rule intended to protect the environment by limiting the spread of slurry during winter months when grass growth is limited and nutrient uptake is low. Waterlogged soil also increases the risk of run-off to watercourses. But farmers said poor weather meant livestock being housed earlier than usual, adding to the volume of slurry. And wet ground has meant they were unable to put slurry tankers on to soft ground for spreading. The dairy cattle on Ulster Farmers' Union deputy president Victor Chestnutt's farm have been housed since August. He has more than the 22 weeks worth of slurry storage capacity required by law, but said it was a third full heading into the close season when it would normally be empty. He said he expected to run out of space in January and knows farmers who are in a much worse situation than him. "It just goes to prove what we have known for a long time, that farming is an issue where you work with the conditions, you don't work with the calendar," he said. Farmers can use an exemption to spread slurry during the closed period as a last resort. Only limited volumes can be put out and detailed records must be kept to show a "reasonable excuse". But it runs the risk of inspection by officials from the Department of Agriculture, Environment and Rural Affairs. If they identify a breach of the rules a significant fine can be applied. Mr Chestnutt said many farmers are afraid to take the risk. The head of the inspection unit said he is aware of the pressures farmers are under this year. Tim Irwin, of the department's water management unit, said he has written to his inspectors reminding them that farmers had faced a "challenging period". He said they want to treat the issue "sensitively" and acknowledge that when it came to sanctions they are dealing with "farmers' livelihoods". His inspectors would look for "mitigating circumstances" for spreading, he added, but farmers should show evidence to support their action.